Chief Minister PK Dhumal said priority would be given to posting teachers first in the remote and difficult areas of the state so that the problem of shortage of teachers was dealt with. Hundreds of anganwari workers and helpers today descended on the Vidhan Sabha seeking a regular policy for their appointment and service. Himachal Pradesh University (HPU) has finally taken steps to ensure transparency in the conduct of the CPMET (combined pre-medical entrance test) which has been mired in controversies in the past. SSB volunteers, accompanied by their families, today staged a protest march in the town demanding jobs for all trained SSB jawans who were less than 35 years in age along the line of what their counterparts in Manipur have been getting by the Ministry of Home Affairs. The police here has arrested one truck owner Taj Deen allegedly for being responsible for the suspicious death of his driver Rattan Lal of Kudhwada village under the Bharadi police station in this district. The body of the driver was recovered by the police from a nullah on the National Highway-21 near here yesterday. Union Steel Minister and Mandi MP Virbhadra Singh’s weeklong tour of the Mandi parliamentary constituency followed by two parallel NSUI functions to celebrate the student body’s foundation day in Shimla on April 9 have exposed the infighting within the Congress down the line. In a statewide boycott call, JBT students from DIETs today boycotted classes and held a protest demanding regular job surety from the government, as the batches would pass out in November this year. The All-India Postal Employees’ union has demanded regularisation of those employees of the department who have completed eight years of their services. Fairs and festivals depict the real life of hill people in the state and it is through these that our rich culture and traditions remain vibrant for the benefit of our next generations. Industries Minister Kishan Kapoor has termed the charge levelled by the Congress that the government was squandering funds on IPL cricket matches as unfortunate and uncalled for and said that the party was making such allegations to divert public attention. The police today registered a case against Congress MLA from Chopal Subhash Manglet on the complaint of the local SDM, who has alleged that he was threatened by the legislator. The police today managed to nab a UP resident, Ravi Ranjan, the main accused in the theft, that took place at a hotel in Chotta Shimla on April 2, by tracking his location through mobile tower. The central Excise Department today woke up to check bogus units which had been trying to hoodwink the authorities by seeking permissions without having set up any infrastructure. Citing revenue loss due to such units, the department sought support of the State Pollution Control Board to furnish information about 37 such bogus units. When several government and non-government agencies are debating on long-term measures to mitigate the effects of changes in environment, an NGO has decided to prepare database of air and water quality for long-term strategy to protect environment in the state. Two persons were killed and seven injured, one of them critically, when two cars (Ascent and Santro) they were travelling in collided head-on at Pirdi on the Bhuntar-Kullu road, about 3 km from here, late last night. The government will formulate a long-term plan to ensure planned development of rural areas to help preserve the pristine glory of the state. Urban Development Minister Mohinder Singh today introduced the Himachal Pradesh Apartment and Property Regulation (amendment) Bill seeking designation of areas where promoters may be allowed to raise constructions. One person was arrested under the NDPS Act at Chhinjra village on the Bhuntar-Manikaran road today. Intervening during the Question Hour in the assembly today, he said the government had already tried to post more teachers in the districts of Kinnaur, Lahaul-Spiti, Sirmour, Chamba, Shimla and Mandi where vacancies were more than in other parts of the state. “I want to assure the members that endeavour of our government will be to give priority to the difficult areas while making postings of the newly appointed trained graduate teachers (TGT),” Dhumal added. It was during the Question Hour that Congress MLA Harshwardhan Chauhan drew the attention of the government towards huge vacancies of teachers at schools in the remote areas. “In some of the schools in the interior parts there is not even a single TGT so will the government give preference to posting of teachers to these schools,” he urged. Education Minister ID Dhiman said during the last two years 2,200 TGTs had been selected and given postings. “It is a fact that there is a huge vacancy of 1,744 TGTs and efforts are on to recruit 1,405 TGTs for which requisition has already been sent to the Subordinate Services Selection Board,” he said. He added that postings of 657 TGTs (Arts) would be made within a month’s time to ease out the position. In reply to another query about part-time water carriers raised by Prakash Chaudhary (Congress) and Ram Lal Markanday (BJP), the Education Minister said the anomaly in the remuneration being given to part time water carrier had been removed and their seniority list had also been amalgamated. “Now all part-time water carriers will get Rs 1,000 per month instead of Rs 1,740 whether they are appointed in primary, middle, high or senior secondary schools,” he said. In reply to another question raised by Congress legislator Yog Raj, Food and Supplies Minister Ramesh Dhawala said the Centre had reduced the rice and kerosene quota of the state. “The rice quota has been reduced from 18,000 to 7,118 metric tonnes while a cut of 31 per cent has been made in the kerosene quota of 4,848 kilo litres,” he said. He said Himachal had taken up the matter with the Centre on several occasions but the quota had yet to be restored. Anganwari workers from all over the state gathered in large numbers at a chowk outside the assembly to draw the attention of the government towards their service conditions. They demanded that they be declared as government employees on the pattern of other states like Pondicherry. Seeking better remuneration and absorption in government service, they said those anganwari workers who had retired be given monetary benefit. They demanded that all anganwari workers as well as helpers be given all benefits given to government employees. They also gave a representation to the government listing their demands for consideration. Unlike the past, the candidates who appear in the test on May 27 this year will be allowed to take home the test booklet and the answer key will be put on the web as soon as evaluation of OMR answer sheets is started. The candidates, if they so desire, will be supplied a photocopy of the OMR answer sheet on a payment of Rs 50. The combined entrance test on the basis of which students were admitted to medical and dental colleges in the state had become a suspect due to repeated controversies, which largely resulted from lack of transparency. The issue was raised by RTI activist Dev Ashish Bhattacharya who posed some pointed queries seeking to know from the university the reasons for not allowing the candidates to carry home the test booklet and copies of the OMR answer sheet and not providing the answer key on the web. Vice-Chancellor Sunil Gupta was quick to take notice of the shortcomings and lack of transparency highlighted through the RTI applications and the representations received from various sections of people. He carried out a detailed exercise to identify the gray areas and decide on the measures required to establish the credibility of the competitive test, which took a beating due to charges of foul play and candidates approaching the courts repeatedly. “The decision to put the answer key on the web along with the result and to supply copy of the OMR answer sheets will enable the candidates to carry out self-evaluation of their performance. In case they are not satisfied with the result they can apply for re-evaluation, for which 10 days time will be provided,” Gupta explained while giving details of the measures taken. He said his objective was to make the annual exercise completely transparent and make all required information public so that there was no need for anyone to file application under the Right to Information Act. Meanwhile, the controversy kicked off due to association of a contract teacher of the university with a local coaching centre has also been settled once and for all. It has been made clear that no teacher, appointed on regular or contract basis, can work in a coaching centre or any other organisation. The teacher concerned has been removed accordingly. SSB volunteers, accompanied by their families, today staged a protest march in the town demanding jobs for all trained SSB jawans who were less than 35 years in age along the line of what their counterparts in Manipur have been getting by the Ministry of Home Affairs. The ministry should provide them jobs as they were trained and have been doing social services and other emergency services in the state over the decades. Addressing the rally, SSB Kalyan Sangathan state president MR Bhardwaj said the Home Minister had announced jobs for the SSB trained volunteers in Manipur. The Gauhati High Court in its judgment passed on the SSB issue on October 8, 2000, had asked the Home Ministry to provide them jobs and other benefits, the SSB leaders said. Bhardwaj said more than 16,000 SSB jawans had been trained since 2000 in over half-a-dozen SSB circles in the state. “We have been discharging odd duties or doing social work in the state,” he added. “But the Ministry of Home Affairs has given us a raw deal. We are not getting uniform, monetary and other benefits,” the SSB jawans rued. The SSB Kalayan Sangathan also cited the judgment of the Himachal High Court that upheld the decision of the Gauhati High Court passed on October 25, 2008. The Gauhati High Court has directed the Home Ministry to provide jobs to the SSB jawans who are less than 35 years in age, the leaders claimed. The SSB Sangathan has sought interference of Chief Minister PK Dhumal, Union Steel Minister Virbhadra Singh and Industry Minister Anand Sharma to take up their just cause with the Centre and Home Minister P Chidambaram. Earlier, SP Kuldip Sharma, accompanied by additional SP Anupam Sharma, visited the spot where the body of the deceased was found by the police with multiple injuries. Taj Deen has been arrested on suspicion and investigation is going on, the SP said. According to reports, the driver had on Saturday crushed a stray cow under his truck in an accident. This had infuriated the villagers and it was on the intervention of Taj Deen that the matter was amicably settled and calm was restored. However, next morning, to everyone’s surprise, the body of the driver was found in the nullah in mysterious circumstances. The fight has reached the high command as party in charge Meenakshi Natrajan has issued a show-cause notice to NSUI leaders Sandip Walia and Balvinder Kanwar on the matter and asked them to reply by tomorrow. The tussle between the Congress’ frontal organisations intensified as party leaders geared up for the final round of the organisational polls to be held in May this year, according to sources. The two factions of the NSUI have exposed factionalism up in the Congress hierarchy as the student body’s group is divided along the Congress main factions led by Virbhadra Singh and Vidya Stokes, the sources added. NSUI president Yadhupati Thakur group’s choice included Virbhadra Singh, Harsh Mahajan, Ramlal Thakur and Sudhir Sharma for the function on the HPU campus. Meanwhile, the other group, led by general secretary Sandip Walia and Balvinder Kanwar, stood for their mentors, Stokes, state president Kaul Singh Thakur, Sukhvinder Sukhu and others for the parallel function at Rajiv Gandhi Bhawan in Shimla. 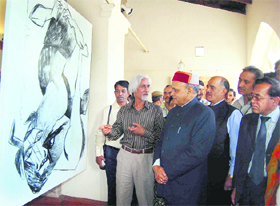 The groupism surfaced during Virbhadra’s recent weeklong tour of Mandi and Shimla. Meanwhile, when quizzed, Yadhupati said he had officially invited all leaders, including Kaul Singh Thakur and Vidya Stokes, for the foundation day being held on the HPU campus. Protesting against the government’s recent notification on filling JBT posts, the JBT students’ mahasabha resented that the government had conducted the JBT test for the 2008-10 batch. However, the government is backing out as the batch will complete its training in November, they charged. Spokesperson of the JBT mahasabha PR Rana said the government conducted the test in 2008 promising to provide jobs to trained JBT teachers. But the government is filling few posts on contract basis and not giving regular jobs as given to the 2006-08 batches in the state, he said. The JBT students urged the Chief Minister and the Education Minister to consider their one point demand of regular job. “The notifications issued in 2006 and 2008 for JBT teachers are the same then why the government is filling posts on contract basis,” they questioned. At a meeting of the union held here on Sunday, president Surender Kumar expressed resentment over the apathetic attitude of the department for not acceding to their demand of regularisation and increasing the workload on the existing staff. The union also sought regularisation of the staff deployed as “gramin dak sewaks” which, it said, would enhance the efficiency of the department. It also demanded that the balance leave of gramin dak sewaks should be added as earned leave like regular employees of the department. The Deputy Commissioner said this while inaugurating the five-day annual summer festival at Ghumarwin, near here, today. In a statement here today he said the statement of Congress spokesperson Kuldeep Rathore was misleading as Rs 3 crore had not been given to the state cricket association for IPL matches but for improvement of infrastructure facilities and beautification of Dharamsala. He said it appeared that the Congress could not digest the developmental works being carried out in the state and its leaders were trying to divert public attention by making such irrelevant statements. Dharamsala was an international tourist destination and in view of its growing importance, all facilities were required to be provided. The funds released by the state government to strengthen the basic infrastructure would benefit the local people and tourists as well. He further said the organising of IPL matches would bring the state, especially Dharamsala, on the world tourism and sports map and generate enormous direct and indirect economic activity in the area. The Congress should extend its support for organising IPL matches instead of criticising the government . BJP MP Virender Kashyap also came out in defence of the government and said that Congress criticism was not justified as huge funds were being spent in improving facilities in New Delhi for the ensuing Commonwealth Games. Holding such prestigious sport event was an achievement for the state for which the credit must go to the president of the association Anurag Thakur who was also an MP. The funds were not being given to the state cricket association but for improving infrastructure so that the international and national players did not face any inconvenience during their stay here. The matches were being shown across the world by TV channels and as such it would provide big exposure to the state, particularly Dharamsala. He said it was not true that the government was patronising the state cricket association because it was headed by the son of the chief minister. The case was registered by the police at the Chopal police station today under Sections 506 and 186 of the IPC for criminal intimidation and obstructing a public servant from performing his duty on the complaint of the SDM, Ramesh Thakur. The SDM is learnt to have made a written complaint to the DC, alleging that he was being threatened by the MLA a few days back. It was on April 3 that the DC wrote to the SP, recommending appropriate legal action in the complaint. Yesterday being a holiday, it was today that the police filed a case against Manglet. Manglet said he had neither threatened nor intimidated the SDM. “As a public representative I only speak with the SDM regarding people’s grievances but on most occasions, including the communal tension in Nerwa on February 12 and accident on February 25, he did not reach the spot immediately, causing problem to people,” he said. He said despite making several calls to the SDM on the day of communal tension, the officer did not answer the phone nor did he reach the spot the same day. He added that the public was facing inconvenience due to the absence of SDM on important occasions. Ranjan allegedly stole a sum of Rs 1.40 lakh kept in the safe of the hotel on the night of April 2 and fled. Having been hired in the hotel only about a fortnight back, the owners had no identification or address of his except his mobile number. “We kept tracking his number which showed his location near Karnal. However, today he called up from a Delhi number which happened to be that of an auto driver, which helped us in arresting him,” said SSP RM Sharma. The auto driver gave information about the train that Ranjan had boarded today from Delhi and it was the Allahabad and railway police which tracked him down. A police team has already been sent to bring Ranjan back to Shimla from Allahabad. “The police has already recovered a sum of Rs 1.28 lakh from him, a new mobile phone and some other items he bought from the stolen money,” said Sharma. The move follows publication of a news item in these columns in which the Pollution Control Board had taken note of 37 such proposals where investors had come forward to seek consent to operate despite having failed to complete the requisite formalities, including proper building, machinery and pollution control devices. In their communication to the board, the excise officials, while seeking help to identify such units, expressed doubts that some of these investors could have got themselves enrolled with their department so as to become eligible to avail benefits of the central industrial package. Earlier, the Excise Department had carried out raids in the Baddi-Barotiwala-Nalagarh industrial area to physically verify the claim of new units which had claimed to have initiated production before March 31 prior to expiry of the central industrial package. The board was now contemplating strict action against such units as it amounted to hoodwinking. What had particularly peeved the officials was the pressure tactics, including phone calls from politicians, to grant the requisite NOCs to such units. Since false affidavits had been furnished by 37 such investors, the board had refused to grant them the permission. Development Action, the NGO, has already started work of making assessment of quality of air and water in every block of four districts of Himachal Pradesh to check pollution content. Beginning this April, the work has started in Bilaspur, Solan, Hamirpur and Mandi districts, which will be later extended to other districts. The actual testing of pollution of air and water will be undertaken by the NGO by involving schoolchildren, mahila and yuvak mandals and other organisations at lower-level. For testing purposes, the NGO has developed two testing kits - Jaltara to test water and Pawantara to test air. The agency had trained students and other people about using the testing kits and now actual assessment work had started. Total six samples of water and air would be drawn from every block on the basis of which pollution contents would be analysed. Frequent tests would be carried out to create a database, which would be utilised for making overall assessment of global warming on our environment. The ill-fated cars later caught fire and were gutted. The injured were taken to the hospital by villagers while two of them succumbed to their injuries. One of the seven injured, Pushpender Singh of Gurgaon, was referred to the PGI, Chandigarh, while others were admitted to the regional hospital here. The deceased were identified as Devi Singh, son of Bhagat Ram of Lugar Bhatti village near here, and Rajinder Kumar, son of Duni Chand of Seol Babharna village near Palampur in Kangra district. Both of them were in Santro car (HP-34 4321) on their way to Kullu from Chandigarh. According to the police, a case under sections 379, 304A of the IPC has been registered against driver of the Ascent car (DL 3CS 6733), Sunny Rathore. constructed as per the specifications of the Act. He said the HP State School Education Board and Education Department should strictly ensure that school buildings were constructed after ensuring all safety measures. The minister said the planned construction would be carried out alongside the roads to avoid any traffic congestion, besides maintaining natural grandeur of the state. Ample parking space would also be constructed in Shimla for the convenience of tourists as well as local commuters. The proposed Act would replace the existing Himachal Pradesh Town and Country Planning Act-1997. The objective of the Bill, the minister said, was to preserve the ecology of the state as at present developers were raising constructions in a haphazard manner at various places. Designated areas would help regulate such construction activity. As per the existing provisions, the promoters were required to furnish the security by the way of bank guarantee or by demand draft on account of 25 per cent development charges, which was refundable to the promoter. To make best use of the security in the interest of HIMUDA it had been proposed that instead of bank guarantee the security would be deposited only by a bank draft. Further, it was proposed that development charges be recovered at the rate of Rs 5 lakh per bigha and to increase the quantum of fine for contravention of the provisions of the Act. SP K.K. Indoria said the accused, Sumit Kumar, son of Hari Bahadur, a Nepalese, was coming on foot from Manikaran side when he was stopped at a police naka. He was frisked by the police and 5.5 kg charas was seized from his possession. The SP further said the district police had seized more than 210 kg of charas in 2009 and about 35 kg during the first quarter of this year. A total of 133 cases under the NDPS Act were registered while 174 persons, including 30 foreigners, were arrested.